At a whopping 5'6", I am a giant among men nobody. The UK average height for a man is 5'9", this is not that tall in the grand scheme of things, but falling a full 3 inches below average puts me in a distinct social group. This is not a woe is me post or one full of tricks on how to appear taller. There is no point in trying to disguise your height, it's not going to fool anyone. [Sidebar, on researching this post, I found many articles were focusing on ways to make you look taller. This is unhealthy and unrealistic] Just embrace the concentrated little package we come in. The real problem for men of smaller stature is fit. This might seem obvious, but realistically most men's clothing is seen in 3 sizes: small medium & large. This generally denotes width & with that proportional length. However, in order for many of us to change length, we must get skinny. The only industry that seemingly embraces and caters to a smaller man is in suiting & formal wear. Why does the high-street overlook short lengths? My perpetual problem is with jeans. I have a 28" inseam. I challenge you to find a shop that does this off the rack (directing me to the kids department is not helpful). I understand the economic reasoning behind brands offering a selected range of lengths but this is still frustrating. I couldn't tell you how much I've spent on alterations over the years, sometimes in line with the original price of the jeans. I find the best option is to stick to classic dark selvedge denim. No fancy finishes (That fading at the knee? It will be at your ankle once you've had them taken up), no additional pockets or patterns (they'll just swamp your legs). Just stick with indigo denim, ultimately more stylish and versatile. I find Gap the best fit for me (short legs, big calves, big thighs, no bum - I sound like a monster). 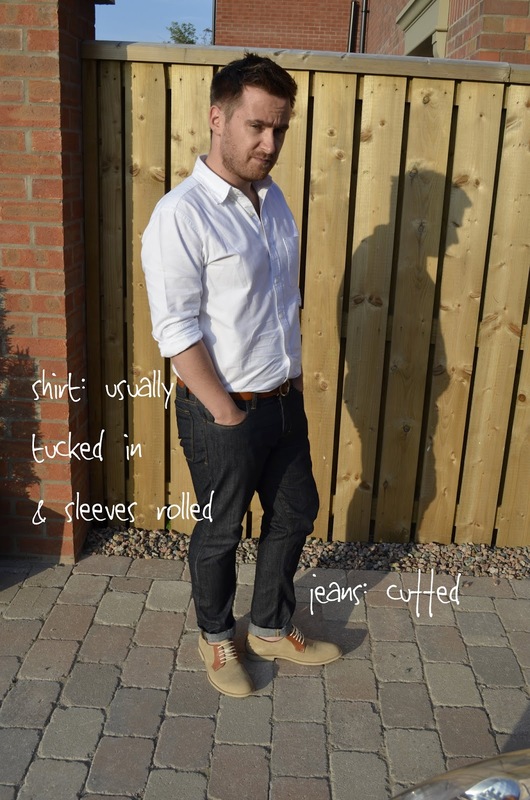 With a good pair of selvedge jeans, you can wear them casual & smart and even get away with a cheeky wee turn-up. I am thankful that turn-ups have made a hipsterish comeback - it's saved me a fortune the past year or so. NB: do not have a turn up more than about 1.5 inches wide, this will make your turn-ups look more like your mummy did it than it was intentional. Over the years I've had to have the likes of shirts (body & sleeves), trousers, jackets, jeans, waistcoats, t-shirts & even shorts shortened. The best advice I can give is make friends with your local tailor/seamstress/alteration god. Explain to them what you want, explain how you want it. If at any time you don't feel confident, don't hand over your stuff - I've learned this the hard way. Can't find a good tailor? Ask your local suit shop where they send their stuff to. A blazer/jacket sleeves can be shortened, but if the body is too long; it's not for you. If your sleeve has working buttons and the tailor looks confused, go elsewhere. Never wear 3/4 lengths unless you're expecting a flood. Always ask for original hems on jeans. I'm 5ft6 as well and I feel your pain around buying cloths. Shirts are my biggest problem. If they fit my chest the arms will inevitably be far to long. To that end I'm teaching myself to do alterations so I don't have to spend a fortune on tailoring or MTM. In other areas I've had some luck with kids cloths. Some of the classic Americana companies often produce garments for their kids lines that are simply re-proportioned adult models. I have boys 14-16 jackets from L.L. Bean and Lands End that fit me very well and are just as well made as the adult version (and priced like them!). I'm told that with my body proportions if I could shop in Tokyo or Shanghai I'd be much happier. I don't see that happening anytime soon however! Hi Brian, thanks for your commment. I've invested in a sewing machine too and can perform basic alterations in length, but nothing on a professional scale. I guess there are worse things to contend with than being below average height but I share your frustrations! I've not ventured into kids clothes as I'd be too heavy set for them but I might investigate the Asian options - there should be something online? Most definitely there are worse problem a guy could have than being five foot six. Mind you I've never had an issue with my height. I did a stint in the infantry were I barely made the minimum height requirement. If there is any job that would stress a shortish guy that would be it. I didn't have any issues then and I don't now. Life to short to fuss over things I can't change. I bought "Shirtmaking: Developing Skills For Fine Sewing" by David Coffin. It's a good book for understanding how shirts are made both for making/altering or just more knowledge on how things are done (I'm big on knowing how things are made even if I have no intention of making them myself). I have some sewing experience but learning curve for shirts is steep . I'm also getting into knitting though this is a bit easier do to my wife being an expert knitter. All in the pursuit of a good fit and hopefully some personal gratification. I'm still working on the cloths from Asian shops idea. There are plenty of shops on-line selling Japanese brands into the North American market but it seems they've been sized for N.A. as well. The shops I've found on-line that cater to their local markets are of course in languages I can't read. I often visit Vancouver were there is a large Asian population but the cloths in the stores don't seem to be sized any differently than here in Alberta. I'll keep you apprised of what I find. Incidentally my last name is Small; go figure eh!